The eternal paradox of being able to sleep at any moment… without ever truly relaxing. This is the reality of living with anxiety and narcolepsy. As a person with narcolepsy, you have probably had people tell you that they are jealous of the fact you get to take naps all the time. Whether a joke or a straight up misinformed comment, this feeds into people’s ideas of naps as a luxury; a habit of those with extra time to spend devoted to relaxation. However, recently I have found more and more that I can’t relax like the average person. It’s an obvious but important thing to note. When you are in danger of falling asleep any time you are relaxed, you start to run into a bit of a problem: how do I live in a constant state of being either directly stimulated or asleep? When I say asleep, I don’t just mean what most people would consider “asleep”, but all of those states between waking and sleep that only narcoleptics get to experience on a regular basis. For most people, relaxing after work means cuddling up on the couch while watching TV. However when you are a person who finds it difficult to stay awake while sitting in a comfortable seat in dimmed light, it’s hardly surprising that this might not be your ideal option. Similarly, the offer of watching a movie on the weekend isn’t one that I often take people up on. It’s not that I never see movies, but it does take something special to convince me that it is worth the risk that I’ll waste my time by sleeping through the most important parts! I also want to spend my time with friends or family actually awake, without a screen constantly threatening to put me to sleep. 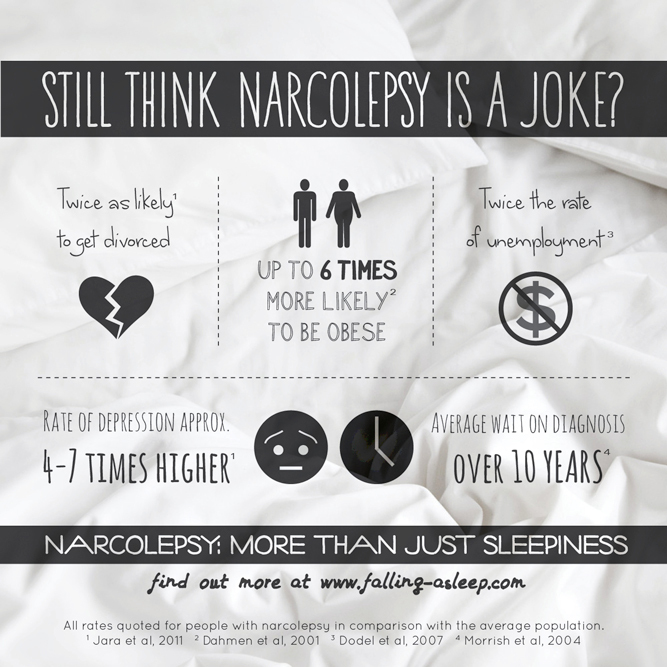 As you may know, people with narcolepsy don’t get enough restful sleep. This leaves our bodies and brains without enough of the crucial process of regeneration that other people receive each night. This also leaves our brains with an increased occurrence of mental health conditions such as depression and anxiety. Anxiety might not be something you would typically associate with a sleepy person, certainly far off from the hyperactive, highly charged stereotype that some people have of the condition. Despite this, it’s actually very common throughout the narcoleptic community, and something I have issues with myself from time to time. Being sleepy and anxious can be a terrible combination, leaving you feeling agitated and jittery without the energy to funnel that restlessness into a productive activity. It can also have the inverse effect of making your poor night time sleep even worse, and causing dream-related symptoms such as hallucinations and sleep paralysis to take on a more worrying tone. Unfortunately narcoleptics also have a lot of things to worry about, with increased chance of obesity, unemployment, divorce and many other things that come together to make even the most sane person feel like their life actually is falling apart. Whether or not you experience clinical anxiety, truly relaxing without falling sleep can be difficult as a PWN. Without the ability to relax, it is easy to feel as if your whole life is spent either under stress (with work, kids or whatever else keeps you busy) or asleep. Not much of a life. Despite all of the odds stacked against us, it’s not a lost cause. Through a lot of trial and error I have discovered some activities that will keep my brain awake enough while allowing it to zone out into that relaxed state of mind. I’ve realised that making time to do these things is essential to keeping my mental health on track! This speaks to me so much. It is so rare for me to feel relaxed, that I can’t think of the last time it happened. I have two settings: drugged up and awake (usually stressed about something) or unconscious. It’s an exhausting cycle. Thank you so much for sharing! This is my life exactly-especially lately. I am working with a therapist & trying to collaborate with my doctors about my meds. Looking forward to your next post! Thank you for writing this. It’s all the things I feel but can’t find the words to explain. I’ll be sharing this with my family. Keep up the great work. I can definitely relate to this. I know when my anxiety is starting to build up because I start having hallucinations and paralysis. I’m still working on strategies that will help to calm things down though, so I’m keen to hear your ideas. Difficulty staying asleep throughout the night is actually one of the typical symptoms of narcolepsy! (Check out the symptoms page of the guidebook or the advocacy tools page for more info on insomnia and narcolepsy). So unfortunately what you are experiencing is pretty common. I was similar in the progression of my narcolepsy: up until diagnosis at 17 I would never have trouble sleeping ever, I would just be asleep all day and all night. Then after I got on stimulants I started to wake up more and more during the night. As well as following basic sleep hygiene, something that might help you would be actually getting UP out of bed when you feel like you truly can’t fall back to sleep, doing an activity like tidying up or reading, and then after a certain amount of time (I do 20-40 mins sometimes!) go back to bed. It should be easier to get back to sleep then. It might seem weird, but I just think of it as a reverse nap! In any case, it’s great to hear you are making progress with your doctor regarding finding the right meds for you. It is so important! I’m going through that now. It’s the most frustrating thing I’ve ever dealt with. I love this post. Thank you for sharing! I was diagnosed with N 21 months ago. To help with the anxiety and depression that often comes with the territory, I started to blog about about. You can read my story here.https://thetruthfairytales.wordpress.com/. Your story helps me realize I’m not a freak and I’m not alone! Thank you so much for putting my feelings into words! They say my narcolepsy is mild, and I’ve never been diagnosed with anxiety, but both have felt a whole lot worse lately. I found your site while trying to research if they give anti-anxiety medications to narcoleptics. I was surprised to find how common it is. Thank you so much! This sounds just like what I go through. I’ve struggled with anxiety and depression my whole life. I have always felt tired, but I just accepted it, even in high school. I would fall asleep in class all the time. Then in my 20’s I just thought it was from having kids, and just life. Then around 3 years ago, I started to experience sleep paralysis more frequently, and started having the hallucinations. They were awful, and I didn’t know what was wrong with me. I had a sleep study done, and that’s when I found out I had Narcolepsy. In a way, it was a relief to hear it…at least I could put a name to my constant feeling of tiredness and my ability to fall asleep if I sat still for too long.